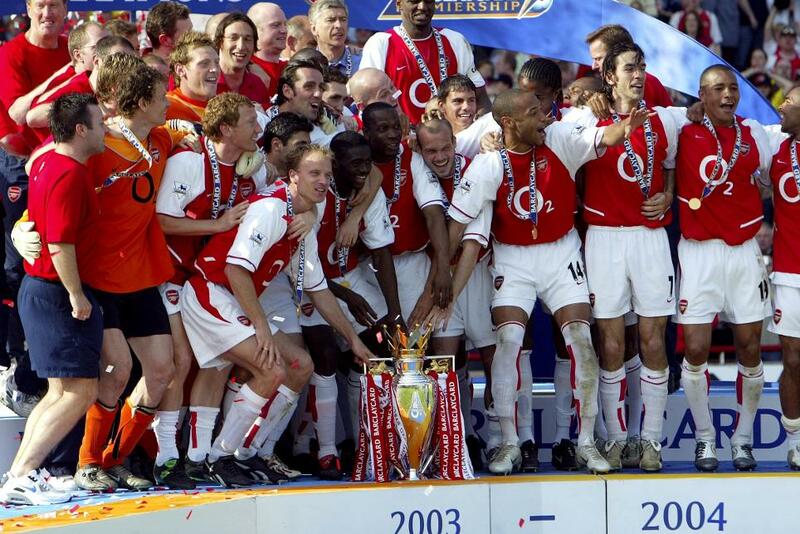 The 2003/04 Premier League season went down in history as a landmark one for Arsenal, who went the entire league campaign undefeated, with 26 wins and 12 draws, as they won the title by an 11-point margin. Not since Preston North End's 22-match campaign in 1889 had that feat been emulated, and Arsene Wenger's free-flowing side were dubbed as 'The Invincibles'. The way Arsenal won the title was far from straightforward, though, and the sense of anticipation and intrigue for the 2003/04 Premier League campaign heightened when Russian billionaire Roman Abramovich took over Chelsea in the summer. Established players such as Damien Duff and Joe Cole were joined by international stars such as Hernan Crespo and Claude Makelele as manager Claudio Ranieri strengthened his squad with several new recruits. The ever-expanding worldwide fanbase of the Premier League were given a unique opportunity to see some of Chelsea's summer signings at the first biennial Barclays Asia Trophy, which has gone on to become a prominent pre-season tradition. The Blues emerged victorious on penalties against Newcastle United in the Malaysia tournament's final, and they carried on where they left off with six wins from their opening seven matches, including an opening day triumph at Liverpool. Also on the opening day, Manchester United were treated to an electrifying debut from 18-year-old Cristiano Ronaldo, who had been handed the No 7 shirt of departed midfielder David Beckham just days after he inspired Sporting Lisbon to a pre-season friendly win against the defending champions. The Portuguese winger played a part in three goals with his dazzling trickery as United won 4-0 against Bolton Wanderers, and he scored his first Premier League goal against Portsmouth in November. United striker Ruud van Nistelrooy also set a Premier League record of scoring in 10 consecutive matches, which returned 15 goals, in August. Arsenal, with goalkeeper Jens Lehmann joined by Barcelona teenager Cesc Fabregas and French full-back Gael Clichy as new arrivals in the summer, also started strongly and topped the pile going into their first encounter with the Red Devils in September. Man Utd and Arsenal battled out a goalless draw, which included a late penalty miss from van Nistelrooy. While the two sides and Chelsea competed for the top three places, a host of surprise packages launched early charges for the top four. One of those sides was Charlton Athletic, and a hat-trick from Kevin Lisbie, including a stunning solo effort late on, sealed a 3-2 win against Liverpool in September. Southampton, whose win against Tottenham Hotspur resulted in the departure of Spurs manager Glenn Hoddle in the same month, were in fourth place by Christmas when they beat newly promoted Portsmouth 3-0 in the Premier League's first ever south-coast derby between the local rivals. Chelsea went top when Frank Lampard's goal sealed a win over United, but their title hopes were hit by a 4-2 loss to Charlton, inspired by Professional Footballers' Association Player of the Year Scott Parker, and his impressive form resulted in a January move to the Blues. Charlton slipped down to seventh eventually, but a late-season highlight saw them beat Blackburn Rovers 3-2 despite a stoppage-time goal from opposition goalkeeper Brad Friedel. Another notable January arrival was Louis Saha at Manchester United. The French forward scored 13 goals in the first half of the Premier League campaign for Fulham. While United and Chelsea toiled, it was Arsenal who went back on top with a 4-1 rout of Middlesbrough in January, the first of nine successive wins, and they stayed at the summit from thereon. A defining moment in the title race came in February, when the Gunners beat Chelsea 2-1 at Stamford Bridge. Still unbeaten, Wenger's side came from 2-1 down to overcome Liverpool 4-2 at Highbury. Thierry Henry, who surpassed 100 Premier League goals during the campaign, stole the show with a hat-trick, which included a wonderful solo run to give the north Londoners a 3-2 lead. The title was sealed when Arsenal, capitalising on second-placed Chelsea's loss to Newcastle, claimed a 2-2 draw with north London rivals Spurs at White Hart Lane. Their unbeaten campaign was completed with a 2-1 win over relegated Leicester City on the final day. Leicester were joined in the Championship by Wolverhampton Wanderers, who came from 3-0 down to beat the Foxes 4-3 earlier in the season, and Leeds United, whose 14-year stay in the Premier League ended with two matches remaining when Bolton beat them 4-1. Leeds had replaced manager Peter Reid with Eddie Gray following a 6-1 thrashing by Portsmouth in November. Manchester City's 40-year-old former Arsenal goalkeeper David Seaman retired in May. In the same season, Newcastle's Gary Speed became the first player to surpass 400 Premier League appearances. Meanwhile, fourth-placed Liverpool parted company with Gerard Houllier and Claudio Ranieri left Chelsea after leading them to their highest Premier League finish since they won the top-flight title in 1955.